Chef Alex Pope is the owner and founder of The Local Pig, a butcher shop that exclusively carries humanely raised animals from small local farms. Before opening the Local Pig Alex worked in the kitchens of some of our favorite restaurants, including The American Restaurant and R Bar so we are excited to see what he creates. Chef Vaughn Good returned to Lawrence after attending the International Culinary Center in NYC. His restaurant Hank Charcuterie gives him a chance to show off his love for charcuterie as he creates soulful meat-centric dishes that reflect the Midwestern ingredients and traditions Vaughn grew up with. * Due to the nature of this event we cannot accommodate dietary restrictions. Since both of the chefs have great relationships with the local farmers that grow food for the Midwest we have asked them to acquire fresh sweet corn from the farmer of their choice and implement it in their first dish. The dishes they create with deliciously fresh Midwest farmed food will be paired with the Midwest’s favorite farmhouse ale – Tank 7! 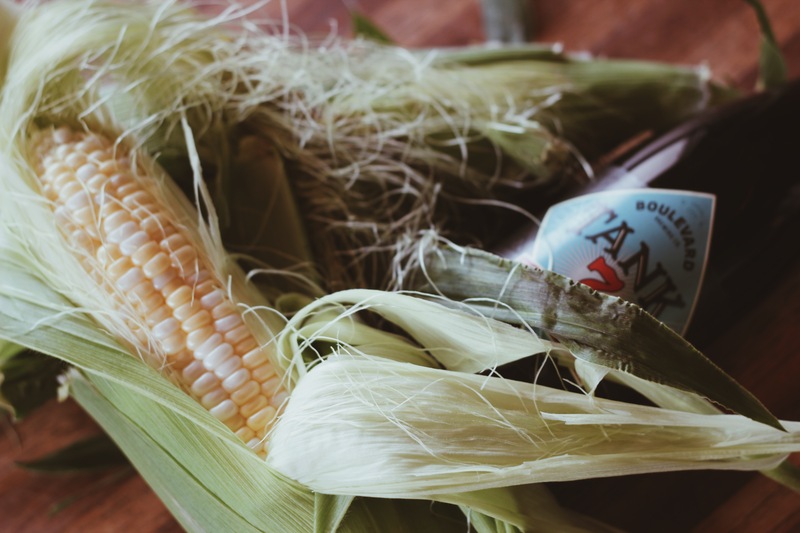 Effervescent and bursting with Belgian yeast aromas, Tank 7 is begging to be paired with dishes featuring corn. Course one will be featuring the most local ingredients we can find so for course two we decided to go exotic. All the way from Japan, we have flown in some Yakami Orchard yuzu juice for our chefs to play with. The yuzu fruit is an intrical component of many Asian dishes, but can be used in many different contexts to add citric, herbal and acidic notes. Both chefs will be creating a dish with yuzu that will be paired with our Double IPA, The Calling. Overflowing with tropical hoppy fruit aroma and flavor, The Calling presents similar citrus and herbal notes to yuzu and should provide a welcoming bridge for the dishes created by Alex Pope and Vaughn Good. We have found ourselves in the amazing position of having too much bourbon maple syrup – so we thought we would share some with our two Tap Chef contestants. The syrup was removed from bourbon barrels that housed maple syrup before we filled them with beer. After filtering the syrup to remove the chunks of burnt barrel still in the uncut syrup we found an oaky, boozy, complex maple syrup. Both chefs will be creating dishes that will be paired with Bourbon Barrel Quad, our barrel-aged quadrupel ale that has tart cherries added to it.